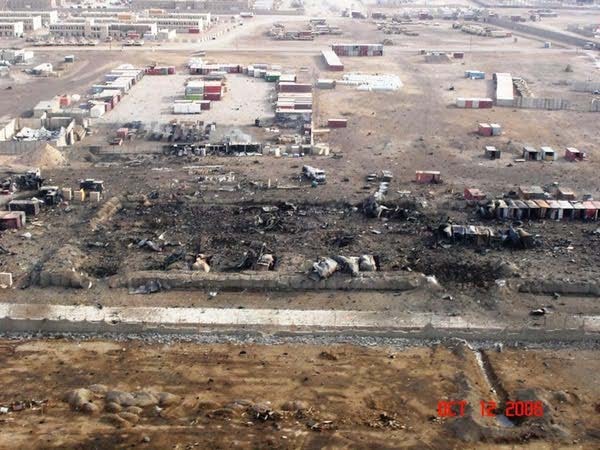 “The attack on Camp Falcon caused huge explosions and fires that burned for 23 hours. Even though this incident was undoubtedly the impetus for the Bush administration to change its "policies" in Iraq, the corporate media has been suspiciously silent. Three days after the Oct. 10, 2006 attack that destroyed the largest U.S. arsenal in Baghdad, President Bush called a meeting of his top military advisors to discuss "policy changes" regarding the war in Iraq. The U.S. corporate media apparently do not see the connection because a $billion in damage to U.S. military logistical support [that] has not made the news. Since there is an absence of "western" reporting on this event, we must rely on the "resistance" for the details of what happened at Camp Falcon. BAGHDAD—The U.S. Falcon base, now described as burned out wasteland with no buildings was the scene of American helicopters dumping water on the site Wednesday to extinguish the last flames after resistance fighters managed to carry out a devastating attack that completely destroyed the American base. …The source said that at the present time U.S. helicopters were pouring water intensely on the remains of the arsenal to make sure that the last flames of the fire were finally extinguished. Earlier that day, U.S. forces announced that the fires were still burning in the arsenal which the Americans admitted was the biggest in Iraq and which they acknowledged had been destroyed. The U.S. military claimed that the devastating explosions that lasted for hours and lit up the skies over Baghdad caused no casualties. Iraqi Resistance forces attacked the largest U.S. weapons arsenal depot in the American General Headquarters in the south of Baghdad late Tuesday evening. The correspondent for Mafkarat al-Islam reported that the arsenal, located in the as-Saqr Base in the south of Baghdad is the main supplier of equipment to the U.S. forces. At the time of reporting, mountains of American arms and ammunition were continuing to explode in the sky in a huge fire unprecedented in Baghdad’s history. In response, U.S. aircraft hysterically rocketed and bombed various parts of the city, the correspondent reported, trying to knock out the launch sites of the rockets that blasted into the American arsenal. A source in the Iraqi puppet regime told Mafkarat al-Islam that the Resistance blasted the American arsenal, known as Camp Falcon, with Grad and Katyusha rockets. The source admitted that dozens of Americans had been killed or wounded in the blasts that were still ripping the American arsenal apart. The source said that the U.S. forces were unable to do anything to stop the massive inferno of flame and explosions that was lighting up the Baghdad sky like fireworks. Reuters reported the puppet regime’s Iraqiyah television network as showing pictures of a huge fire lighting up the night sky. Reuters reporters in central Baghdad heard more than 30 explosions, which began at about 11pm local time Tuesday night. The puppet Iraqi Interior Ministry said the explosions had rocked three neighborhoods close to Forward Operating Base Falcon in the southern Baghdad suburb of ad-Durah. …General al-Ithawi said that the Falcon base was the biggest U.S. arsenal in central Iraq and was the launching point for U.S. military operations. The arsenal contained more than 50 tanks; numerous artillery pieces; a landing strip for Chinook helicopters, some of which were parked there when the place exploded in addition to armories containing weapons and ammunition. He said that all the buildings and furnishings of the base had been totally destroyed along with the archive records. General al-Ithawi said, however, that the biggest fear among Iraqi puppet officials during the night was that the Americans might have stockpiled low grade nuclear arms or chemical weapons like those used in the Second Battle of al-Fallujah on the base. Had such weapons been there, the death toll of Iraqi residents of Baghdad could have been in the thousands. Below is the list of Americans killed on Falcon October 10, 2006. Official Casualty List from U.S. military hospital at al-Habbaniyah located some 70km west of Baghdad. American-occupied air base there had begun to receive dead and wounded personnel. in response to sharply rising (and redacted) US casualties.